Southern rock band Lynyrd Skynyrd would suffer great losses in a plane crash on October 20, 1977. Lynyrd Skynyrd had just released the album Street Survivors and were five shows into what promised to be a very successful tour. A chartered plane carrying the group from Greenville, South Carolina, where they had just performed to Baton Rouge, Louisiana, ran out of fuel near the end of their flight and crashed into a forest in Gillsburg, Mississippi. The cause of the crash was listed as inadequate flight planning and an engine malfunction of undetermined nature in the right engine which resulted in a higher than normal fuel consumption. The group suffered great loses in the crash as founding member Ronnie Van Zant, along with Steve Gaines, Cassie Gaines, and assistant road manager Dean Kilpatrick were all killed on impact in the crash. Several other band members and road crew suffered serious injuries. The emotional and physical scars of the crash took a decade to heal. In 1987 Ronnie Van Zant's younger brother, Johnny Van Zant, took over as the new lead singer and primary songwriter of Lynyrd Skynyrd. While the band has undergone many personnel changes over the years it has continued to rock on. 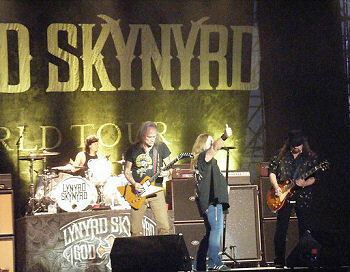 Lynyrd Skynyrd is best known for the songs "Free Bird" and "Sweet Home Alabama."